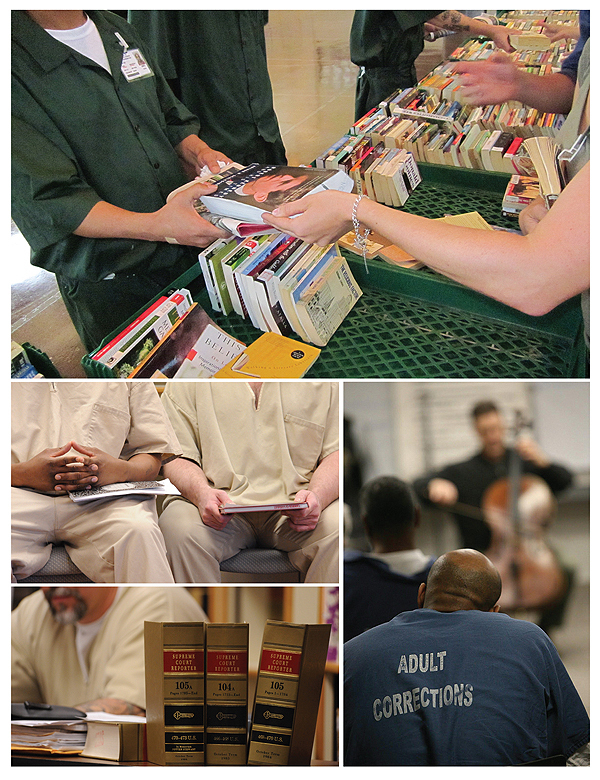 in Connecticut to Hennepin County, MN, librarians are helping inmates prepare. It’s a Thursday in early June as a cart laden with books is pushed down the corridors of the George R. Vierno Center (GRVC), one of the correctional facilities on New York’s Rikers Island. The library may consist only of a small storeroom of books and a cart, attended by Nicholas Higgins, supervising librarian of the New York Public Library’s (NYPL) Correctional Services Program (CSP); Luis Torres, a NYPL information assistant; and several volunteers, but library service to the inmates of GRVC is definitely welcome. The CSP cart visits two units in GRVC, 17A and 17B. As the B side inmates are served first, an inmate in A admonishes B to hurry up. As B takes its time, the A side’s calls become more insistent. After the rounds, as the cart nears the small storage room that holds CSP’s books and magazines, an inmate declares, “Y’all don’t come to my house. This is the only place I can catch you.” The inmate looks forward to obtaining National Geographic. In Higgins’s view, providing library service to inmates and those returning from prison is fulfilling the democratic mission of the public library because it allows “a wholly segregated group of people” access to information that most Americans take for granted. “There are definitely people there who want to better themselves but have not had the opportunity,” Torres says later. He notes that Rikers does contain inmates who are interested in doing little more than waiting for their day at trial or waiting out a short sentence (Rikers houses some ten separate jails but does not hold longer-term prisoners). However, many inmates, he thinks, have not spent much time in libraries, and CSP’s service provides a chance to start learning what the library can offer. CSP can only reach a limited number of inmates, but Higgins says Rikers’s leadership is cooperative. Acknowledging the need for public safety, he and CSP make it a point to be “as flexible as possible” in working with corrections officials. Since that day in June, Higgins has become associate director for community outreach for NYPL. Credited with expanding CSP’s service, he wants to move services to prisoners and returning inmates from the “margins” to being an integral part of public library service. Now, he oversees outreach to hospitals, nursing homes, and homeless shelters. He sees an opportunity to reach ex-offenders in shelters, noting the correlation that often exists between homelessness and having been incarcerated. Nearly 1.6 million people were in federal or state prisons in 2011, according to the Bureau of Justice Statistics. City and county jails are also full of people. Though there are increasingly vocal calls to reevaluate stiff sentencing for less serious crimes, this is unlikely to cause a dramatic decline in prisoners anytime soon. Meanwhile, each day, thousands return to their communities from some form of incarceration. What is changing is a growing realization that more public, prison, and jail libraries can better identify and serve the often significant needs of inmates or those prisoners who are returning to their communities. Not only are some libraries providing books, they are providing innovative programs and services, helping inmates and returnees to learn about work and employment opportunities, the arts (see sidebar, “Arts on the Inside“), and to develop job-seeking skills. In the view of Daniel Marcou, correctional librarian, Hennepin County Library (HCL), MN, public and prison libraries should be striving to ease the reentry of inmates returning to their communities. “From a community safety perspective, helping people [who are or who had been in prison] make positive changes is important,” Marcou insists. 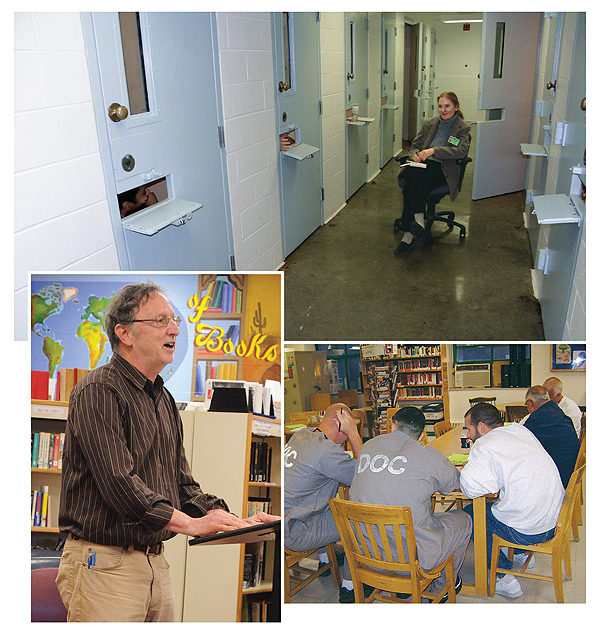 Daniel Marcou, while Nicholas Higgins (inset) supervises the library program at Rikers Island (bottom). Hennepin, like NYPL’s CSP and many prison libraries, has programs to instruct and help encourage inmates who are parents to read to their children. One goal here is to help prevent the children from following in the footsteps of their parents. Likewise, Marcou believes it is important to address employment issues of returning inmates since being able to obtain and hold jobs is a crucial factor in achieving successful reentry, and helping former prisoners improve their literacy and job search skills is crucial to helping them get work. This led to Marcou’s initiation of the Freedom Ticket blog, which showcases organizations and services offered by governmental agencies and nonprofits that can help returned inmates. Residents of Hennepin County’s correctional facilities receive a print version of The Freedom Ticket newsletter quarterly. 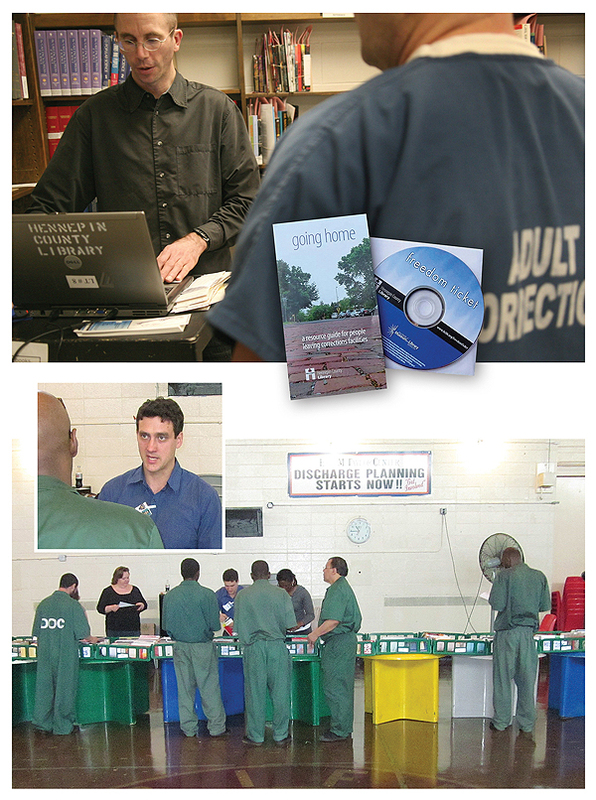 An online orientation video (also available on DVD) assures returning offenders that they will be “treated with dignity and respect” by library staff. Taking advantage of HCL’s resources and services dealing with education, employment, and health can help returning inmates to “make positive changes” in their lives. A foldout map-like “Going Home” guide lists HCL locations and resources “people leaving corrections facilities” can access to obtain assistance with employment, education, housing, health, and family matters. HCL in partnership with Goodwill Easter Seals also offers a program called “World of Work” at its North Regional Library to help ex-offenders with job searches, training location, résumés, and interview skills. However, Marcou knows that many people who return from incarceration are interested in developing their own businesses, such as landscaping or cleaning, and raises this issue at the job workshops he delivers at the county and state corrections facilities. He has invited a community librarian to deliver a talk on self-employment resources and programs to residents of the county’s Adult Corrections Facility (ACF). Every week, Marcou and his coworker Renée Hasse visit the Hennepin County ACF to provide inmates with requested information and books and magazines as well as manage the collection at the on-site library facilities. ACF reentry and education staff and volunteers assist facility residents with the use of the resource room to search for education- or employment-related information. The computers are connected to the library’s network, and filters have been adjusted to create safe Internet access to appropriate websites for reentry information needs. One of the many benefits is the direct exposure to the HCL website and increased awareness for the facility residents of all the online resources it has. HCL plans to provide more digital literacy instruction at the facility in the future. Hildie Kraus, branch manager of the Bonita-Sunnyside branch of the San Diego County Library (SDCL), shares Marcou’s concern about helping inmates and former inmates sharpen their job skills. California’s overcrowded prisons are seeking to reduce their populations, which makes “rehabilitation, reentry, and reintegration” of the utmost importance, according to Kraus. “A major component of all of these is getting a job,” she explained in a presentation to California librarians about her “Welcome Back: Ex-Offenders Rejoin the Workforce” training sessions held in summer 2011. Kraus was working in SDCL’s El Cajon branch when a heavily tattooed man who’d been “inside” admitted he was unable to use a computer to obtain a library card. Inspired in part by that incident, Kraus started attending monthly Parole and Community Team (PACT) meetings sponsored by the California Department of Corrections to inform recent parolees about community services and resources. Kraus’s own surveys of PACT attendees showed that they were eager to develop their job search, computer, and interview skills. Obtaining an in-kind contribution from SDCL, a $5,000 Library Services & Technology Act (LSTA) grant, and smaller grants from the library friends and the SDCL administration, Kraus established two month-long training sessions in July and August 2011. The funds covered payments for flash drives, substitute staffing for Kraus and her assistant instructor, job-readiness trainers, and literature on reentry, résumés, and interview skills. Still, the program remains something of a niche service. Expecting over 20 participants, only one person showed up for the first class. Eventually, between four to six people were participating regularly. A total of 22 people attended, some graduating from the first session, then returning for classes during the second session. Yet many participants would come when they could and Kraus, taking into account their different needs and skill levels, would provide the instruction they needed rather than falling back on her initial, more structured lesson plans. Kraus says “being flexible” in instruction is important. Two job-readiness trainers spent hours coaching participants in how to be effective in a job interview. A high school intern videotaped the participants, who found it useful to see their body language and their responses to issues such as gaps in their résumés. Participants in post-program surveys showed they all knew more about computers, had developed résumés, and had applied for jobs online. They felt more confident about going employment. Kraus notes the program cost only $11,000; maintaining a single person in a California prison costs nearly $50,000 annually. “So if one person from this program doesn’t go back to prison—you do the math,” she said, closing her ­presentation. “It’s all about reentry, reentry, reentry—that’s why we do what we do.” insists Diane Walden, coordinator of institutional library development (ILD) for the Colorado State Library. 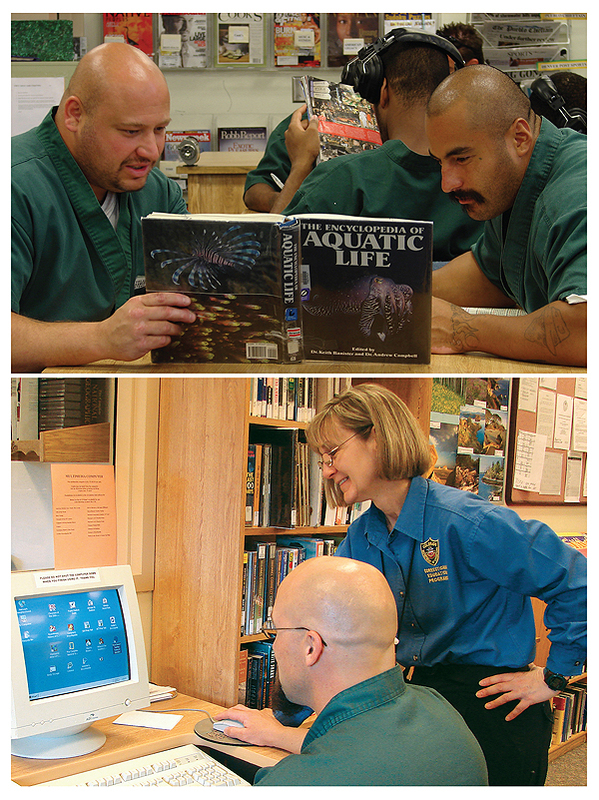 Colorado’s prison library program is a unique collaboration between the Colorado Department of Education (CDE), which includes the state library, and the Colorado Department of Corrections (CDOC), which administers libraries in state correctional institutions. ILD’s coordinator and the two regional librarians who advise state prisons must be trained in CDOC procedures and are actually housed at state prisons and expected to participate in facility operations, such as lockdowns. Colorado’s ILD was credited recently in Corrections Today, the magazine of the ACA, with launching “ground-breaking initiatives” such as intranet training of prison library staff and an online library management system, which provides inmates with access to an online catalog but which is customized to prevent inmates from using features such as email. While formal classes at CDOC prisons stress reentry issues, the Colorado State Library’s Walden notes not every prisoner likes or seeks out classroom learning opportunities, but they will use the library and can be reached that way. Prison libraries, says Walden, are in a “unique position” to reach inmates through reentry materials and programming. A positive solution is to provide financial literacy programs as Renée Robbins and Janice Chiaro decided to do a few years ago when brainstorming ideas for potential programs at Colorado Territorial Correctional Facility (CTCF). They arranged for a guest speaker from Wells Fargo Bank to address the inmates. Robbins added the Wells Fargo CD-ROM on financial literacy, called “Hands on Banking,” to the library computer loaded with reference and skill-building ­software. At least 30 inmates started the program; approximately half were able to complete it. Inmates averaging 80 percent on all modules received certificates for completing the program. Robbins says some lost interest, but many inmates considered the program valuable. “There were offenders who rarely used the library but who came to complete the program because they saw it as something they needed,” Robbins recalls. That provided an opening for library staff to demonstrate how the prison library could help them obtain information that would be useful to prepare for their release. “At every opportunity,” says Robbins, “we encouraged [the inmates] to use their public libraries” upon returning to their communities. Robbins insists that a program such as the one implemented on financial literacy at CTCF is a boon to inmates. The prison library, she says, is the best place to offer such sessions because it is “open for anyone to use” and inmates realize their staffs “want to help their patrons succeed” once they leave prison. Back in 2008, the Colorado State Library’s Walden had delivered a talk with then-ILD staff member Erica MacCreaigh and two others at a Colorado Association of Libraries conference on “Life After 20-to-Life” that urged greater public library programming aimed at people returned from prison. Melanie Colletti, a student in library science at the University of Denver, heard the presentation and found herself “amazed” at the scarcity of library services available to ex-offenders. She helped to create a resource guide for inmates returning to their communities to find services of use to them. Working at the Community Technology Center (CTC) at the Denver Public Library, Colletti and a former supervisor, Megan Kinney, now director of library services at Community College of Aurora who shared the interest in outreach to ex-offenders, developed the “Free To Learn” (FTL) program. The program provides free space for former inmates who are often residents in transitional houses and helps them to learn computer and Internet skills that often are not taught in prisons. The program is staged just for returning inmates in part because some halfway houses require verification of the location of their charges. In such cases, FTL will call the halfway houses to let them know who is attending. Colletti collaborates with librarians at the Denver Women’s Correctional Facility, delivering regular talks there about the Free To Learn program and other DPL offerings. She visits half-way houses to meet with residents and staff. One participant said, “I’m not comfortable in groups of people.” Colleti tells prison and half-way house residents to ask for her by name to help put them at ease. “When I see people face-to-face and tell them it is okay to come to the library and ask for me, that helps to defuse some of that embarrassment.” says Colletti. Colletti’s statistics from FTL’s first year show 78 percent of the women completed job applications during their sessions. Breznau of DWCF stresses the need for partnerships between prison and public libraries. When inmates are free, she insists, they should be able to obtain “the same quality of help” for their unique information needs from public libraries that they receive from prison libraries and staffs. The Pew Center on the States’ 2011 report, “State of Recidivism: The Revolving Door of America’s Prisons,” notes that at least 95 percent of prisoners ultimately will be returning to their communities after incarceration. Policymakers are increasingly aware that “aggressive recidivism reduction is a smarter approach to curbing corrections costs and protecting public safety.” It cautions that besides a prison record, people returning from prison often have great needs stemming from poor education and lack of effective life skills. Stronger efforts by prison and public libraries to help prisoners and people returning from prison to their communities can help them start to narrow those gaps. Glennor Shirley, retired coordinator for Maryland’s prison libraries, hopes public libraries and prison administrations and their libraries will work in partnership more. More librarians share Shirley’s views. Rhode Island Department of Corrections librarian Loretta M. Cimini in a presentation last year to the Rhode Island Library Association expressed hope that public libraries will better serve one of the most “under the radar” groups—released inmates. Most librarians know that Hamlet avenges the death of his father, the king, by killing his uncle, Claudius. However, thanks to some surprising interventions, Claudius sometimes avoids this patricidal fate. When Laura Bates, professor of English literature at Indiana University, started a program called “Shakespeare in Shackles” for inmates placed in segregation at the state-run Wabash Valley Correctional Facility, she created a small circulating library devoted to the Bard’s works. Prisoners in segregation—because of their violent behavior—have few privileges, according to Bates, including access to general library services. Bates details how one inmate in solitary, Larry Newton, benefitted from participating in her classes exploring Shakespeare in a forthcoming book, Shakespeare Saved My Life: Ten Years in Solitary with the Bard (Sourcebooks, Apr. 2013). ARTS INSPIRATION Top: Professor Laura Bates conducts her “Shakespeare in Shackles” class with Wabash Valley Correctional Facility inmates in “supermax” (i.e., long-term solitary confinement), who participate through the cell doors. Bottom left: At Garner Correctional Institution, Mark Aldrich directs the Garner Players. Frequently, inmates will rewrite the plays to reflect their own changing perspectives. For example, Hamlet may spare Claudius’s life as prisoners reconsider their own thirst for ­vengeance. Not every prisoner can be changed via humanities intervention, but Bates has met those who say they have not killed thanks in large part to exposure to works like Shakespeare’s plays. She says there should be a place for arts and literature programs in prisons and jails and their libraries. Mark Aldrich, a librarian at Connecticut’s Garner Correctional Institution, a state-run high-security prison, concurs. Aldrich coteaches playwriting and performance classes for inmates. When a class ends, inmates write and produce their own plays before audiences that have included the staff of a local literary magazine, prison and school officials, and businesspeople. Plays written by students in Aldrich’s writing classes include one dealing with a discussion between a father who had been incarcerated and his estranged son and another with a job interview between a just-released inmate and a recovering alcoholic. As a master’s degree candidate in applied theater at the City University of New York (CUNY), Aldrich also brings fellow classmates to help with the prison theater group, the Garner Players. One session conducted by fellow classmates had inmates consider how maleness should be defined in prison. The games and exercises that occurred led to the inmates improvising short scenes that would later move on to the development of full plays. Aldrich delivered a talk on “The Rehabilitation Potential of Applied Theatre” at a conference held earlier this year by ­CUNY’s John Jay College of Criminal Justice. In a paper, Aldrich asserted that simply participating in plays or visiting the library will not curb recidivism. “But what I am suggesting,” he wrote, “is that a consistent, steady commitment to a physically and emotionally safe place with institutional support in which individuals are treated fairly and with respect, and are given an opportunity to participate in their own education, is a start.” That applies to his work in Garner’s library and with his playwriting and performance classes. Massachusetts’s Department of Correction created a program called Able Minds (Altering Behaviors Through Literary Exploration and Moderated Inquiry-based Discussion Sessions) back in the mid-1990s that is now administered by its prison libraries. State prison librarians in Massachusetts offer all kinds of programming, ranging from poetry groups to regular book discussions. Able Minds is notable for attempting to use literature to inspire inmates to consider making long-term behavioral changes through a ten-step process called Think First that starts by asking participants to assess their situation and ends by having them take action to accomplish self-identified goals. Inmates, often judged to be high-risk, read books and plays such as Ben Joravsky’s Hoop Dreams, Harper Lee’s To Kill a Mockingbird, and Tennessee Williams’s A Streetcar Named Desire. Able Minds discussions take place in an eight-week consecutive course. The first seven sessions are one-hour chats. One book is read per week, and librarians link those books with the Think First steps, promoting personal reflection. The eighth week is two hours long, and inmates receive certificates for completing the program and review what they’ve learned. Ally Dowds, librarian at Massachusetts’s Bay State Correctional Center, explains that she chooses books based on a balance of readability, literary quality, and content. Often, selections feature “a seriously flawed character” or events and decisions likely to provoke discussion. “This often ends in the group taking sides, but it also encourages inmates to demonstrate empathy,” explains Dowds. As with Bates’s program, inmates are often pleasantly surprised to learn they are able to read challenging material. Dowds insists on the beneficial effects of the process. Inmates are able to “break down the walls” of the seriously flawed character and then “break down the walls” regarding their own “faults and failures.” Participating in Able Minds can force inmates to realize the destructive choices they made, their toll on themselves and others, and consider making positive changes.